Airbag/SRS Warning Light Stays On All the Time! I've had the car 2-1/2 weeks, has maybe 850 total miles on it. No mods yet. It started out intermittently for a couple of days, but now the yellow airbag / SRS light in my left gauge window stays on all the time. Anyone got any helpful ideas before I go through the monumental task of arranging to drop the car off @ the dealer? I would take it to the dealer. It is likely a defective airbag module. No, that doesn't mean Ford makes POS cars. I have had the following Ford products. 1993 Ford Thunderbird: Drove 189,000 miles. Repaired broken power window bracket at 120k. Cost me $30. Repaired broken windshield wiper motor at 160k, cost me $50. 1998 Ford Taurus: Drove 199,000 miles. A/C broke at 180k and I didn't bother to fix it. Brake lines rusted through at 199k, but that was my fault for putting it in salt water (towed jet ski). Gave it to a friend for his farm and it's still running. 2000 Ford Focus ZX3: Drove 36,000 miles (lease). Zero problems. 2006 Ford Focus ZX5: Drove 48,000 miles (lease). Needed a power steering leak fixed around 30k. 2009 Ford Flex: Driven 20,000 so far. No problems. 2011 Ford Mustang: Driven 500 miles so far. Driver side seat scuffed before delivery. Being fixed under warranty. So, I've driven almost 500,000 miles total in my Fords, and had the cars in for service a grand total of 6 times. One of those was my fault, and another one was likely done by a truck driver or railway worker. I'll take 4 problems in 500,000 miles over 3 problems in 145,000 any day; especially considering that only one of those four problems happened anywhere close to the warranty period. I believe their may be an issue with the steering wheel airbag clock spring. At least the parts catalog shows their will be an updated assembly for this on the Job 2 Cars. I had a similar problem on a Dodge Pickup. It would hang and unplug the harness when the wheel was turned. 2011 Ford Mustang 5.0.... Sticky Clutch at 6500+ rpm. Ford is replacing entire clutch asembly on my car and re-engineering pedal assembly on future cars (Root cause believed to be pedal effort assistance spring in pedal assembly and tolerance stack-up). Now if Fedex hadnt disappeared my parts I would already be fixed. If you buy a car that has just went into production their will always be more issues than if you wait until its been in production for a year or so. Thats true whether its a Honda or a Ford. Last edited by Gene K; 6/26/10 at 01:25 PM. That sounds reasonable (that a Dodge truck would have something wrong with it) - LOL, j/k I had a Dodge Dakota, so I "know". As I told the dealer when I bought the car, I don't care about the warranty - I don't want to have to bring it back for warranty service AT ALL. Why would you not care about getting any issues fixed with no cost to you, other than the inconvenience of not having your vehicle while it is being repaired? I want my car to be like my Honda Accord & Odyssey, in that I've only had to take them in for warranty service a total of 3 times in over 145,000 combined miles of driving. What was corrected under warranty on those vehicles? Having a defective air bag module (if indeed that is what it is) does not necessarily imply that there are going to be related or additional issues. I had the same issue with my 05 and had to take to dealer. Turned out to be a loose harness connection under the passenger seat. Took them about ten seconds to push the plug all the way in and send me on my way. Cost me a half day taking it into the dealer. May want to peek under your seat. I know the feeling. Had the same problem you describe with my GT at about 600 miles. Brought it in no appt, they pulled codes to find out it was the sensor under the drivers seat, module AR3Z*63611D11*A. But, they had to remove the seat. If you end up with the same defective module, tell them to also get the replacement seat trim as the retaining clip gets destroyed when the old one is removed. My light is fixed but I'm waiting for that seat trim replacement. I chalk it up to the infant mortality rate in one of the umpty up sensors. My point is that because of where I work, and the fact I work & have kids, taking a car somewhere to get fixed is a royal PITA, regardless of whether it's "free", so it really isn't "free" to me. Therefore, a car where everything works is more important to me than a car where stuff breaks and even tho it's under warranty I then gotta go thru an act of congress in logistics to get it fixed. Unless you are living my life, you may not understand. The Ody: brake groan (TSB) and Power steering pump cavitation (also TSB). The Accord: a driver seat bracket that need to be replaced because it developed a "thunk" while turning (the little UHMWPE bushings got worn prematurely. Hopefully this will be no big deal. I'll get check under my seats for a loose connection. Thanks to all for the help! So go pay someone to fix it if you don't care about the warranty. Not really sure at how to respond to this. Last edited by Double-EDad; 6/26/10 at 10:15 PM. Tonight I checked the electrical harness connections under both seats, focusing on the fasteners that were yellow. All seemed ship-shape, and the SRS light is still on. So it must be that steering wheel clock spring issue. Makes sense. Maybe the dealer will have Saturday hours; I can live with this issue for a few days. Didn't mean to turn this into a pity party or anything. As if life wasn't interesting enough, my home A/C lost its mojo this (hot) afternoon. Late Saturday afternoon. Perfect. Really glad I am not the only one with the problem. I took mine to the dealer 6 days ago. I got the car back 4 days later. They fixed the problem. Drove it for two days, then the light came back on... I had to take it back to the dealer again today! It took the dealer 4 hours to diagnose my problem last week as the driver's seat module, and had to order the part. It's been a week now and still no part. When it DOES come it I'll have to take my car back there for another 2-1/2 to 3 hours while they install it. So what exactly is the seat trim they will destroy? I am having difficulty picturing in my mind what you are talking about. Which retaining clip? seems like a long time to get that part. There is a metal retaining clip that holds the under the seat trim piece to the seat frame about where the arrow is in the picture. 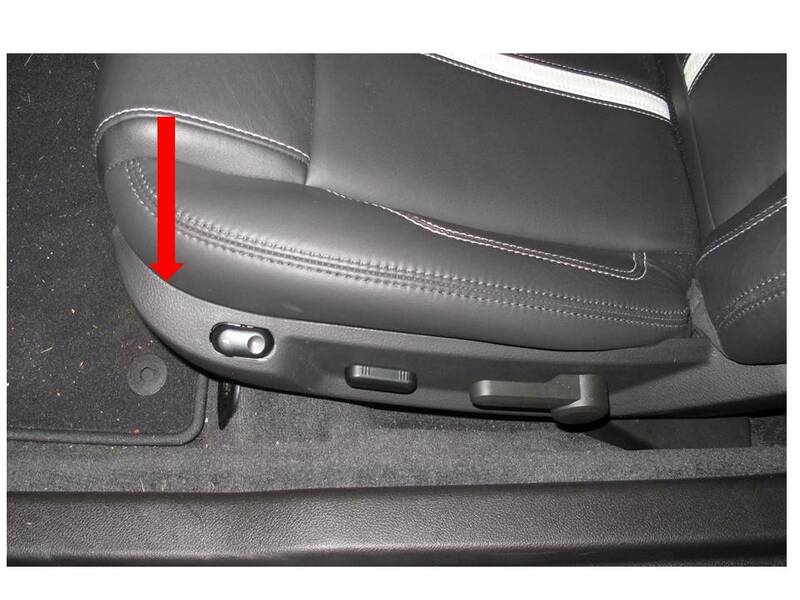 During their replacement of the air bag module, that clip was deformed and weakened and did not retain the trim sufficiently to the seat frame which allowed front part of the trim to separated from the seat after a few road bumps. Going back to the service department, I pointed separation and they just replaced the entire trim part, new clips, switches and all. We have been fine since, but it did take a few trips. If they do the same repair, give that trim a few tugs to make sure its being held securely, it may save you another could trips. Hope it all works out well. note: the replacement took about 1/2 day, (I left the car for the day) so your 3 hour est sounds good. Last edited by phitchco; 7/10/10 at 07:01 AM. THANK YOU that is very helpful! I'll make sure they all know when I drop it off that I'll be watching for it. If anything Ford's quality has gotten much better. These things happen to all makes and models and first year vehicles are obviously more prone. I would be more concerned with the people doing the repairs. I am currently having an issue with my Dodge RAM truck. The headliner had an obvious defect so the dealer replaced it however, doing so they put a small dent in the roof and scratched up several plastic pieces and left sometype of glue residue on my seats I don't blame the manufacturer but the dealer. Most of the time you won't know who is working on your vehicle. Needless to say I ripped into the Service Manager. I just had the same problem with my 2011 GT. I resented both connectors under the driver and passenger seats and the light is now off. Quick Reply: Airbag/SRS Warning Light Stays On All the Time!